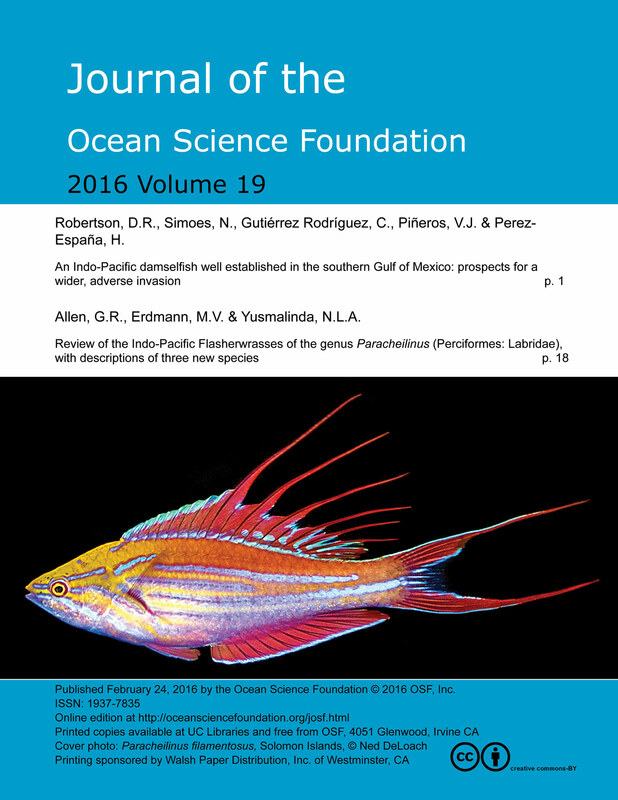 ISSN 1937-7835, The Ocean Science Foundation. 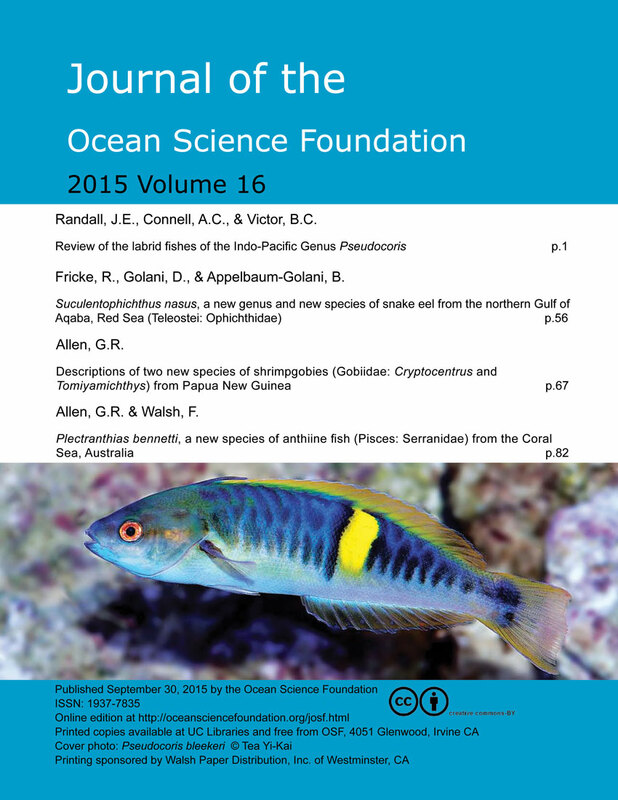 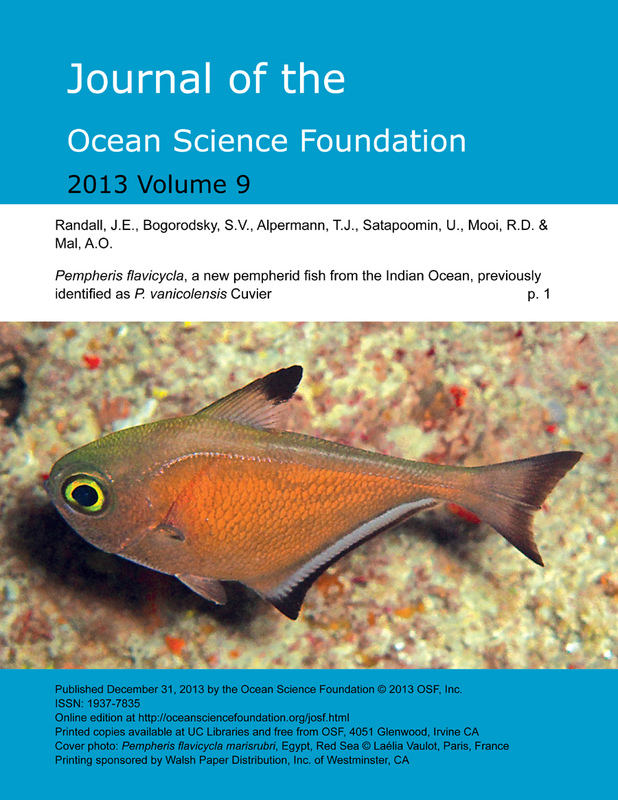 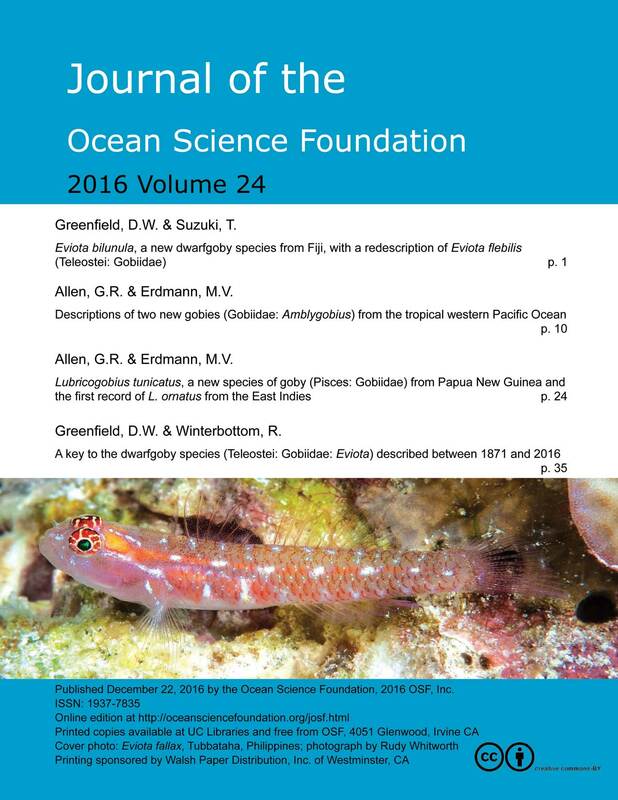 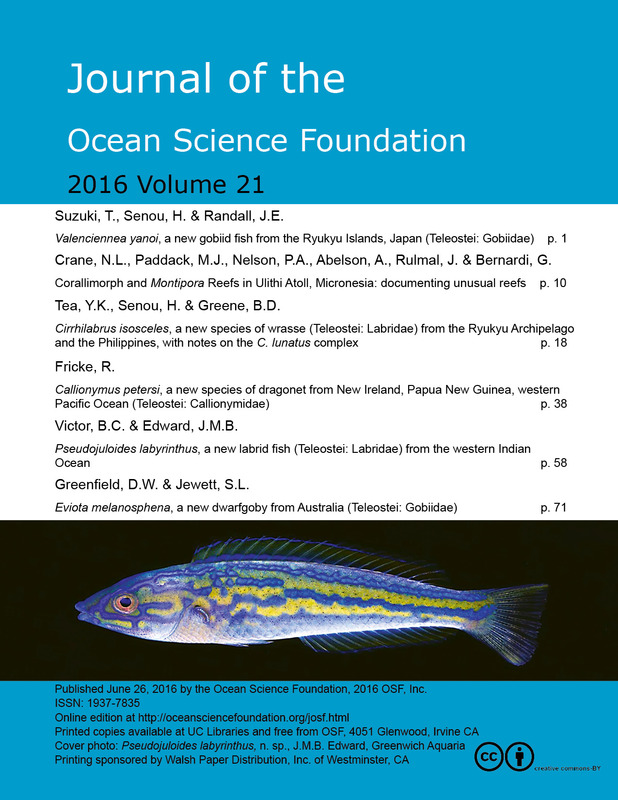 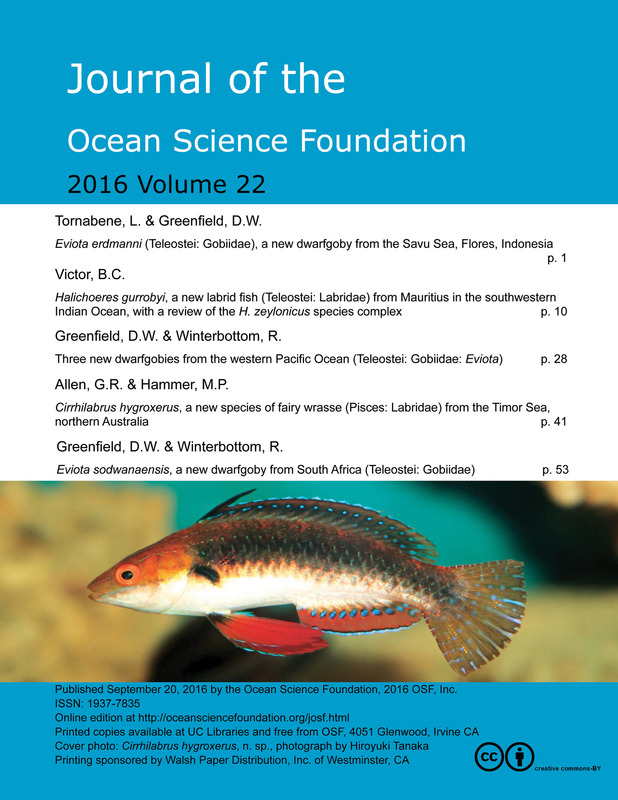 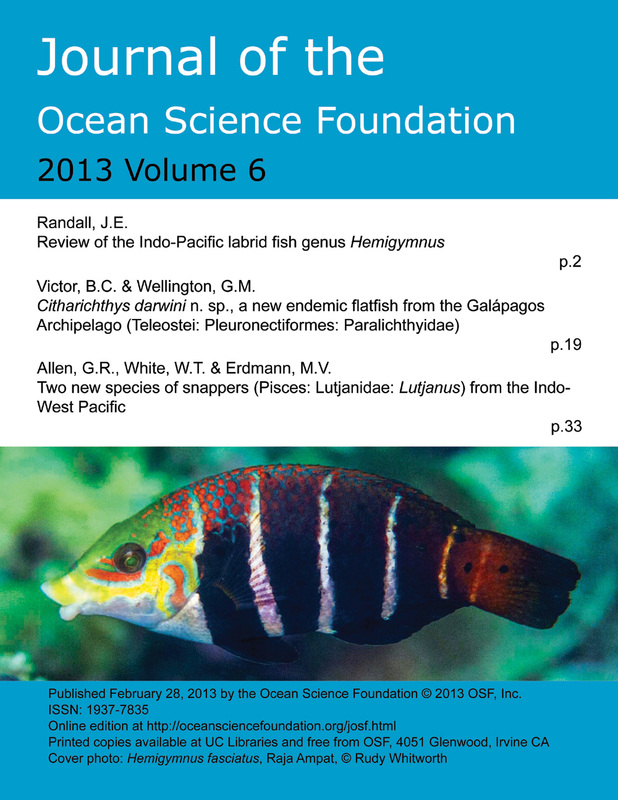 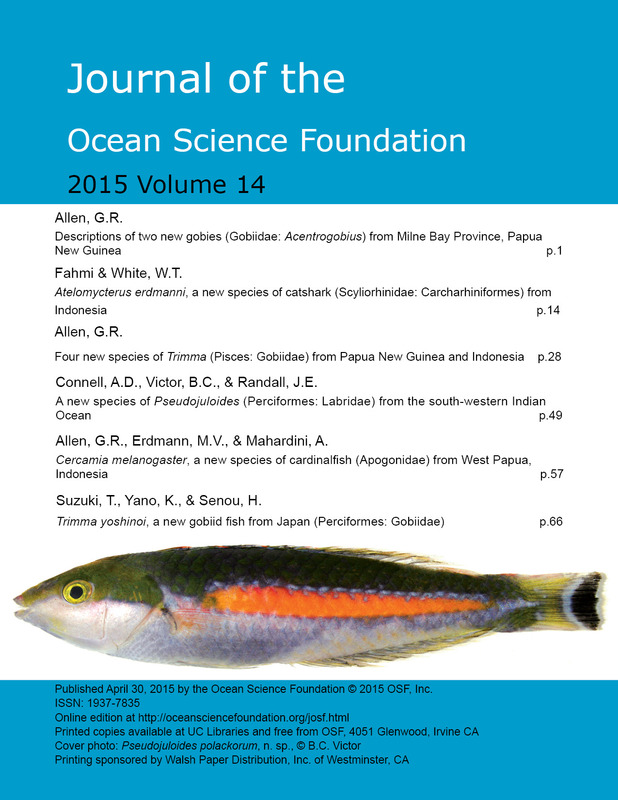 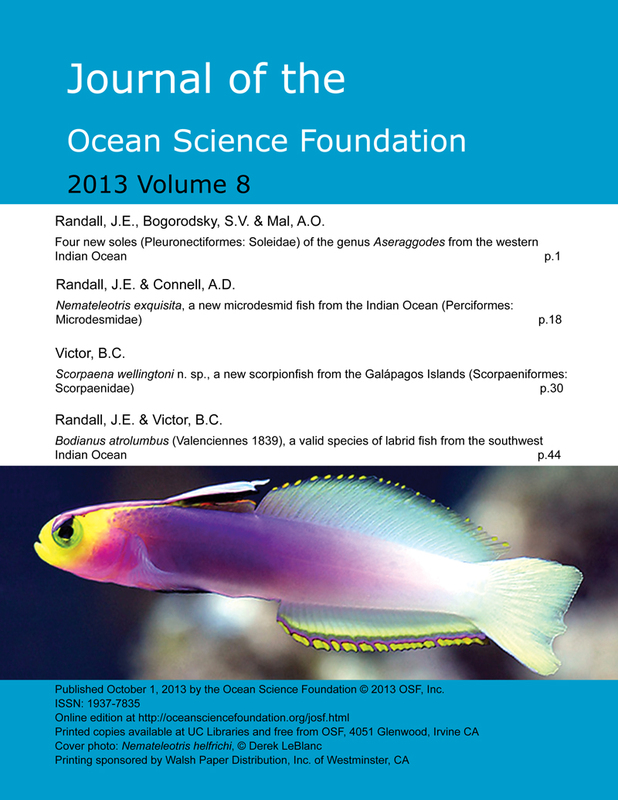 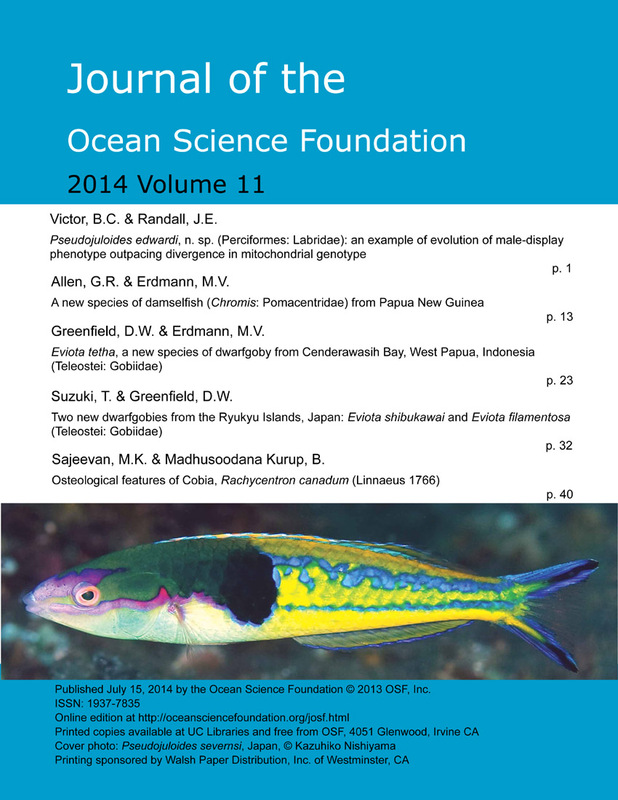 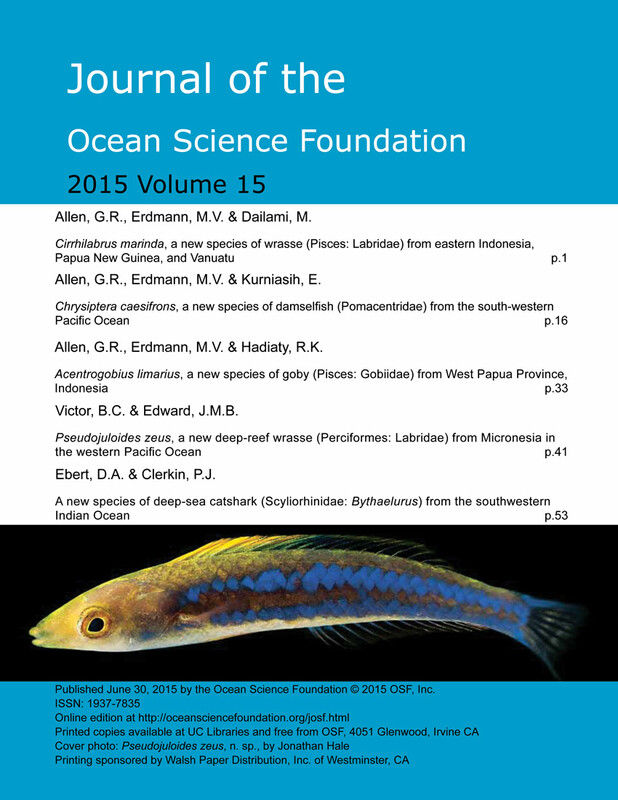 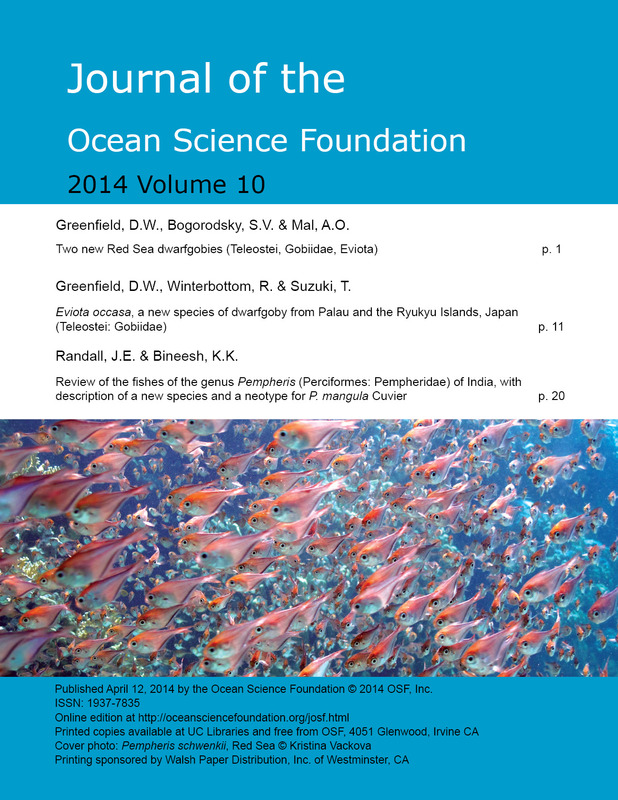 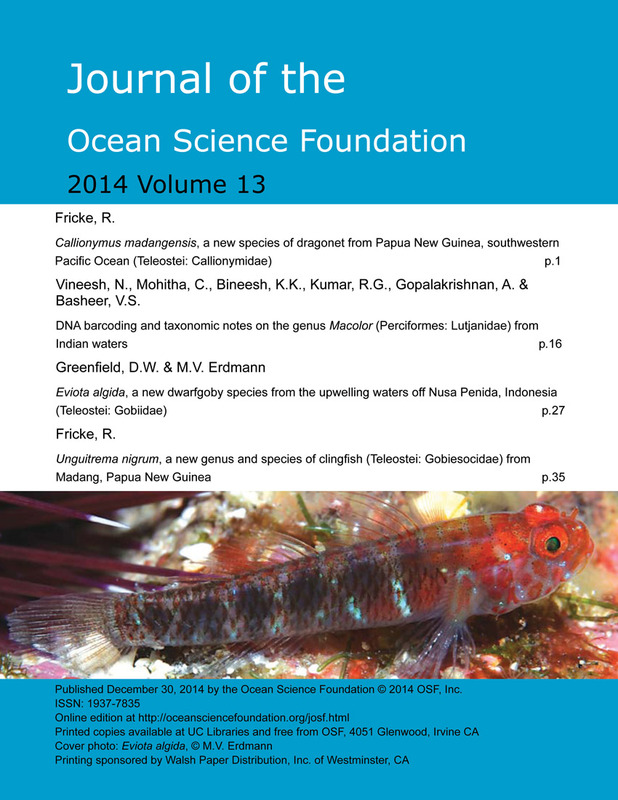 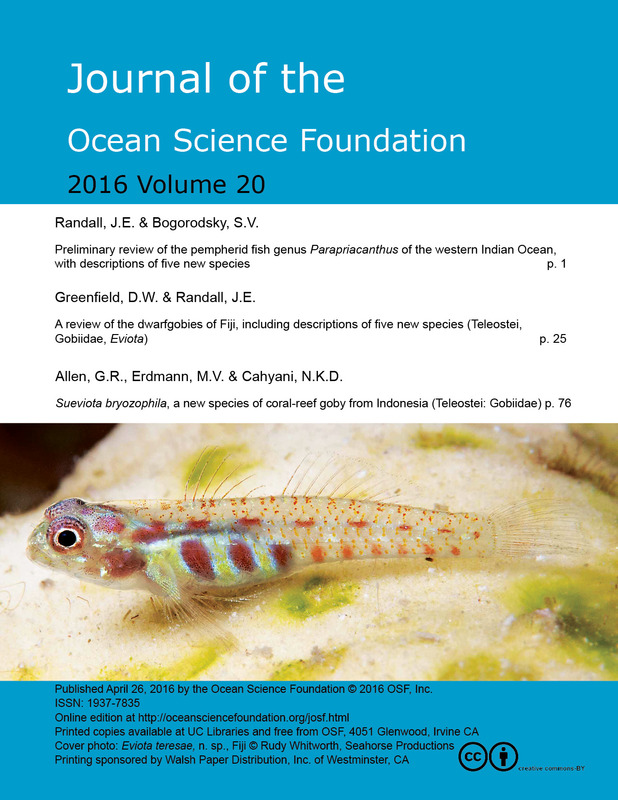 JOSF focuses on the taxonomy and ecology of coral reef fishes and is open to submissions in the field. 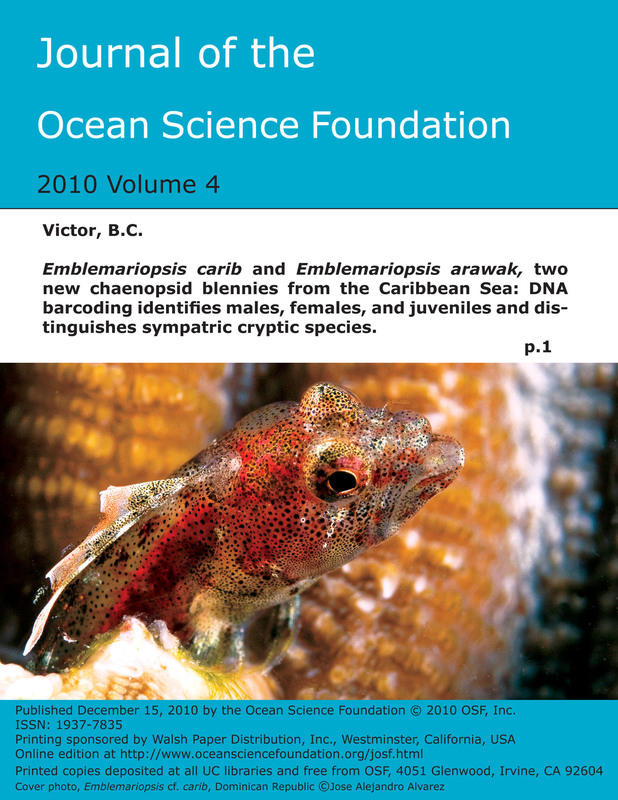 We offer free publication and open-access, rapid review and publication, online digital and hard-copy print submitted to libraries, with a turnaround of days to weeks. 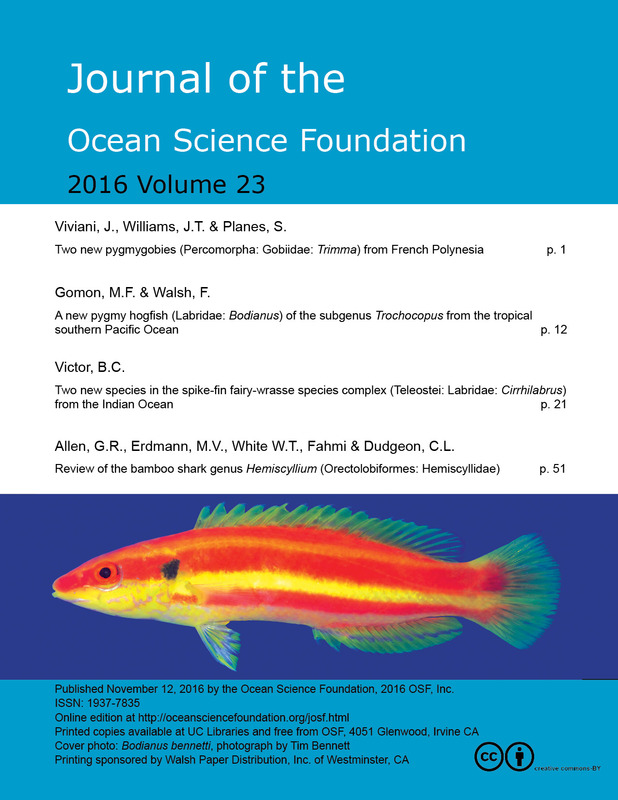 The journal is not just an e-publication for species descriptions, but a traditional printed journal. 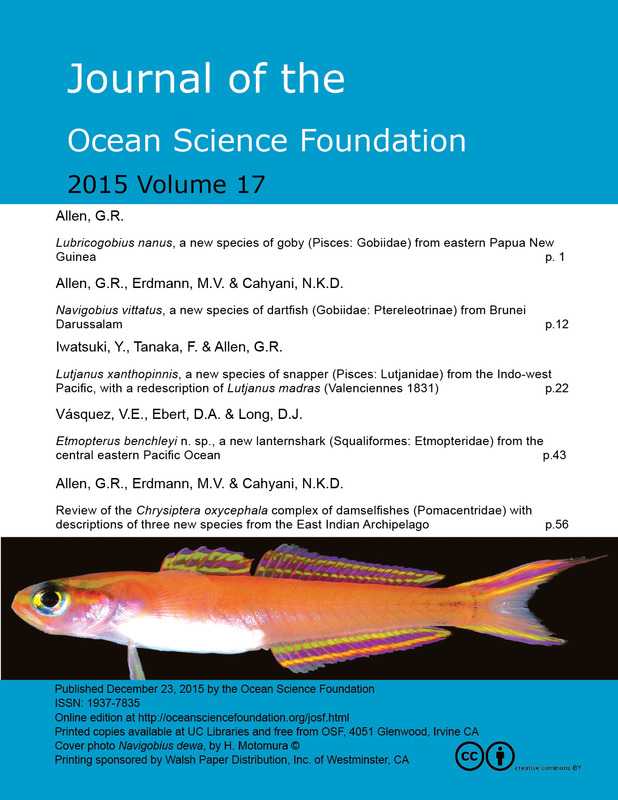 Why another journal? 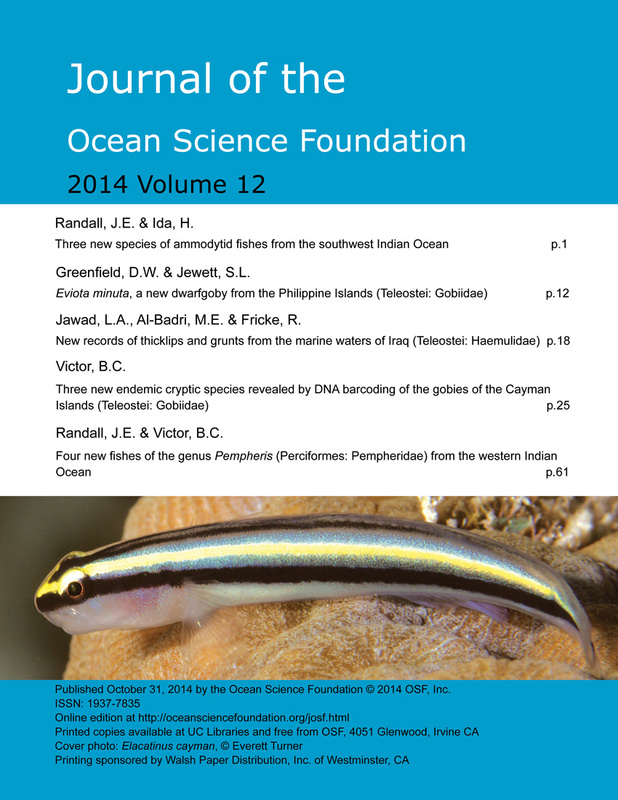 The era of the traditional printed journal is rapidly waning. 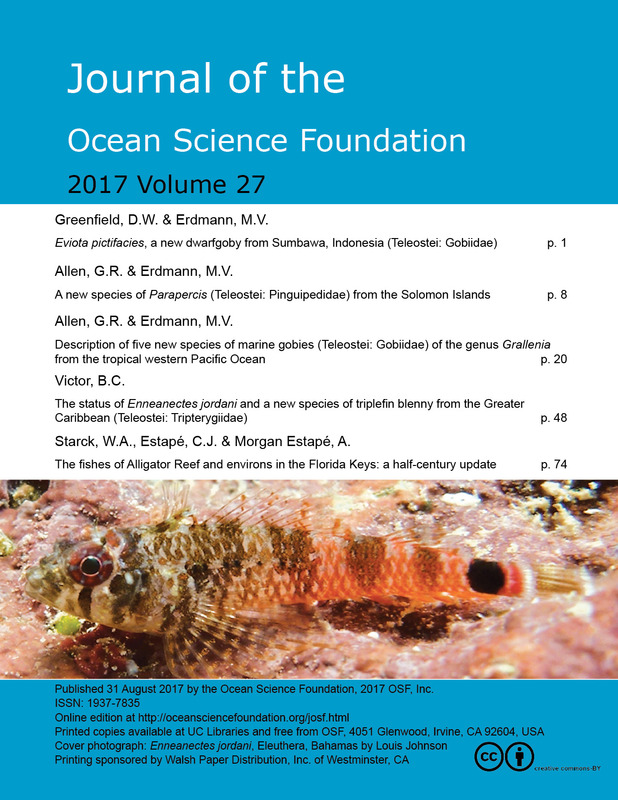 The restricted access, high selectivity, and bundling into journal issues we have become accustomed to were simply products of the cost of paper and printing. 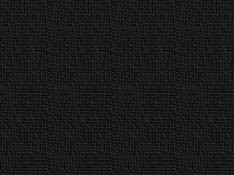 Now, with easily accessible software for layout as well as online digital publishing, the cost barrier is being eliminated. 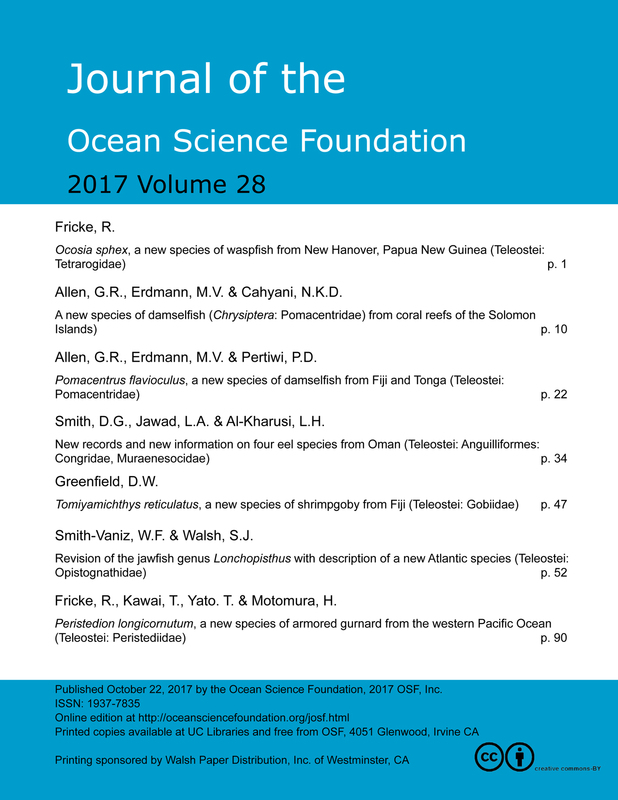 During this transition period, a variety of hybrid models are proliferating- mostly combinations of printed and online, subscription or free, peer-reviewed or not. 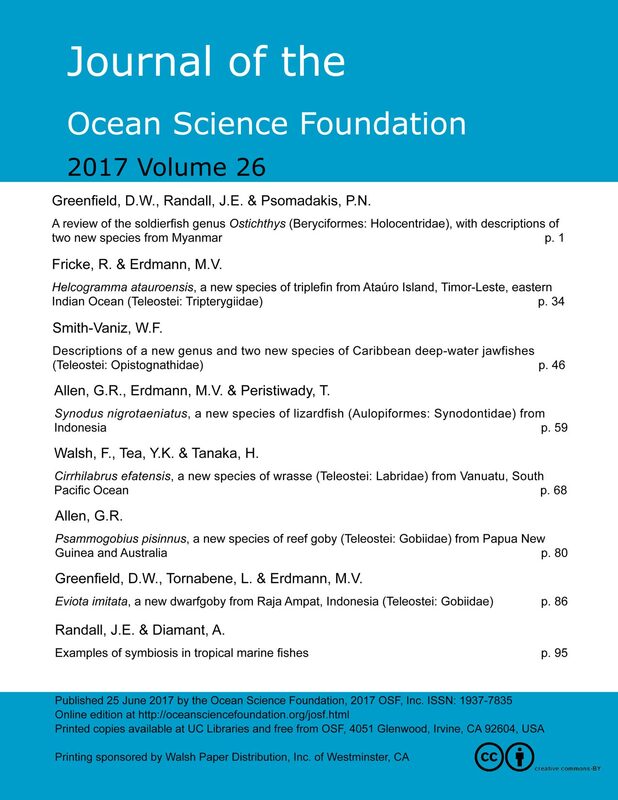 Numerous online open-access journals have recently sprouted, some dubious and predatory, with high and/or hidden page charges. 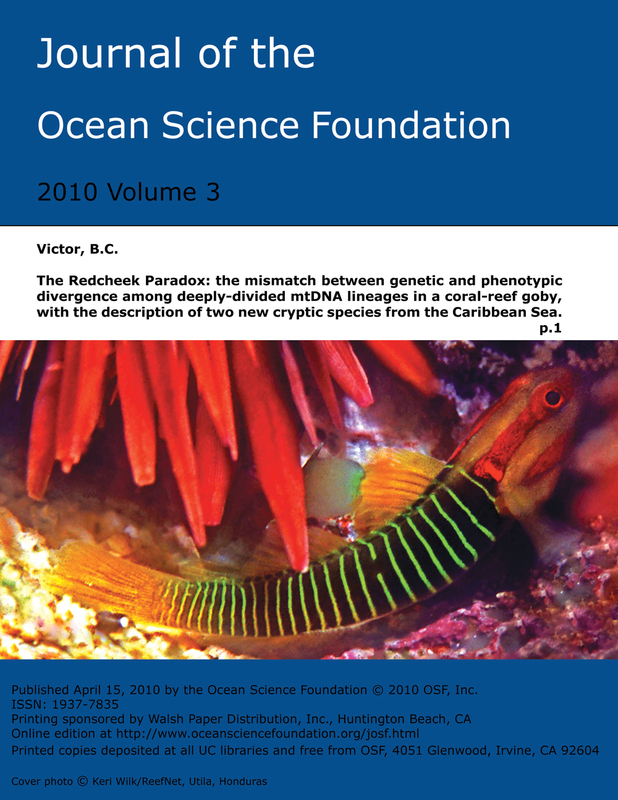 But, since each paper is individually accessible and searchable on the web and stored in archives with a doi (in our case, via zenodo), the compendium it happens to be part of and who happens to host the collection is really irrelevant. 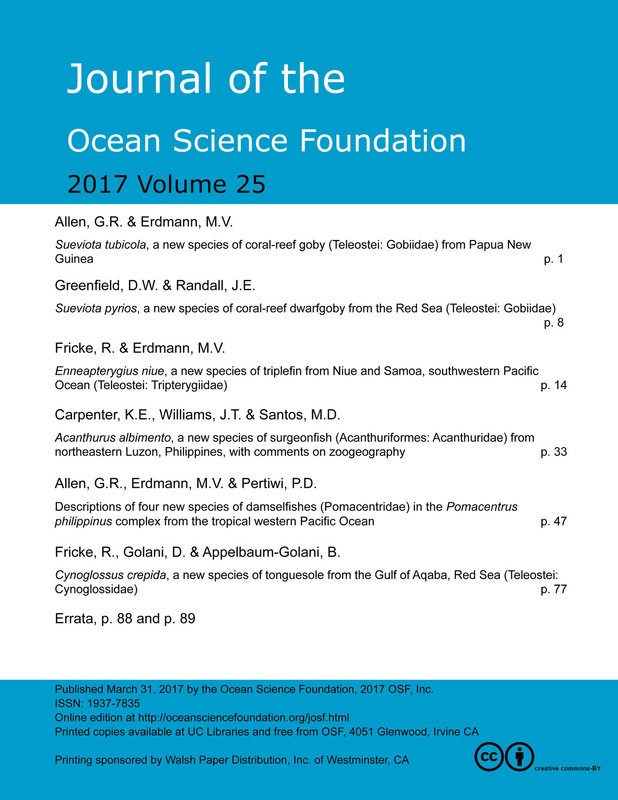 Clearly, the model for dissemination of scientific results is changing quickly, with progressive fragmentation of journals and ever wider and easier access. 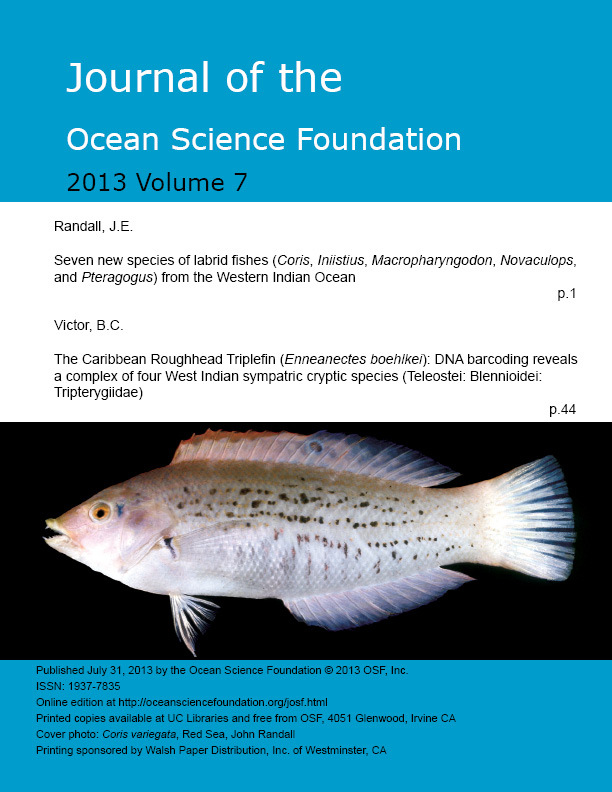 Zootaxa has become the leading fish taxonomy journal at present, but, unfortunately, most articles are not open-access and remain inaccessible to many readers. 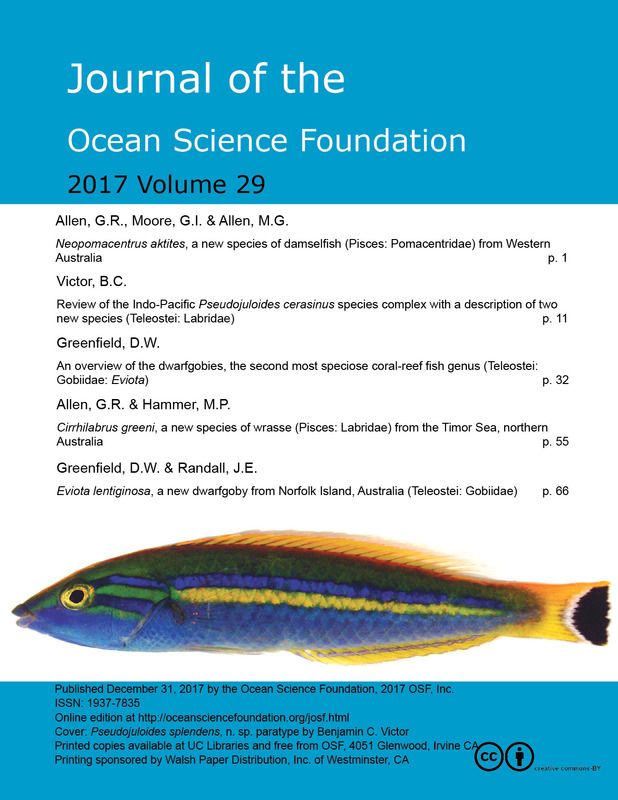 PLoS One recently entered the taxonomy business, but charges thousands of dollars to publish a paper, without a hard copy. 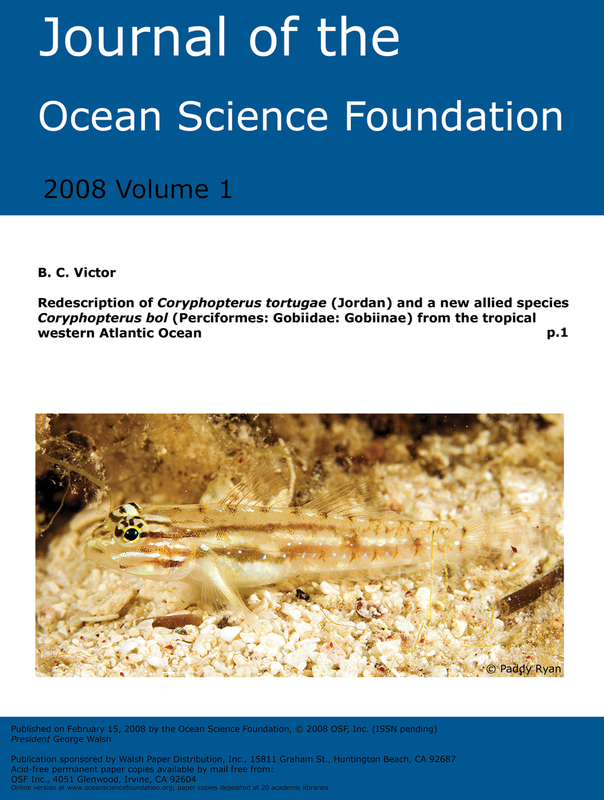 The older traditional ichthyology journals, like Copeia, are slow, copyrighted against pdf copying or web-posting, not open-access and unavailable to those without expensive subscriptions. 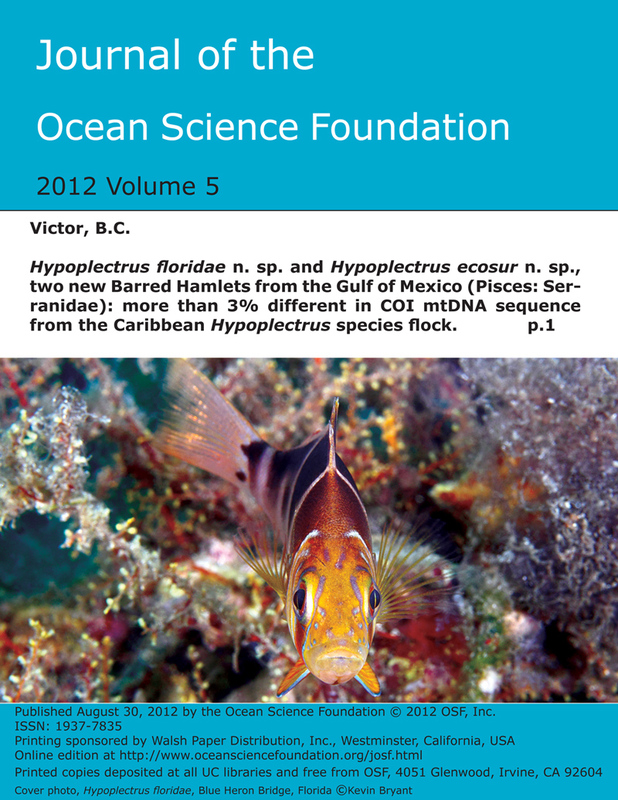 E-mail the editor, Benjamin Victor, for information on submissions (ben "at sign" and then coralreeffish.com). 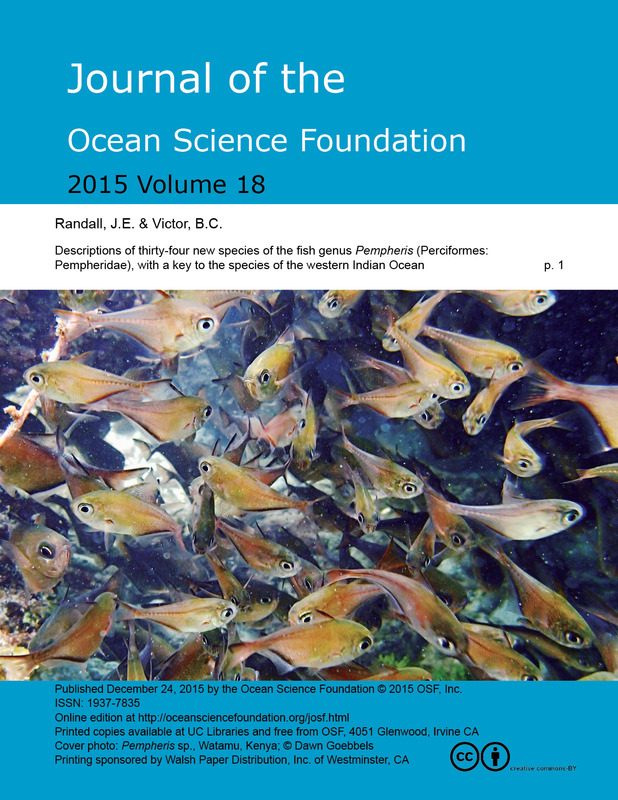 Submission criteria, standards, and the editorial board and practices are listed here. 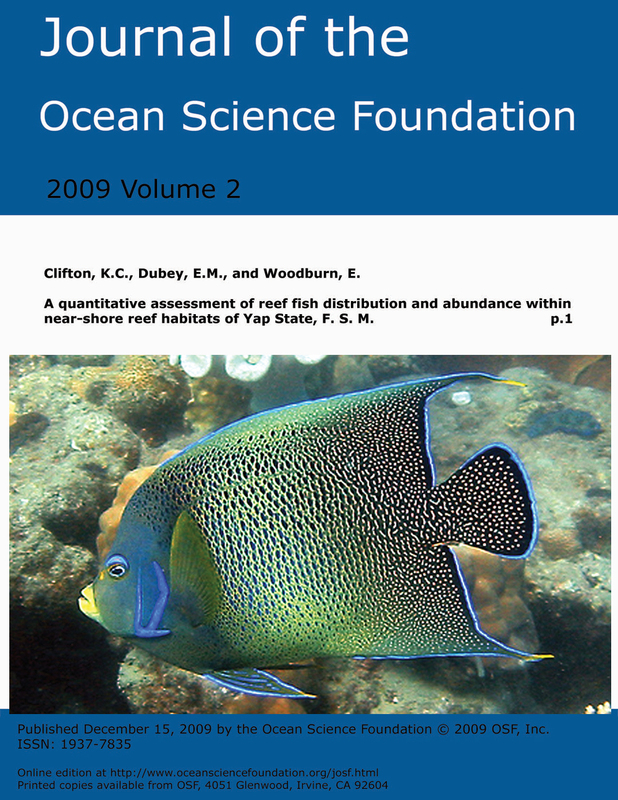 A quantitative assessment of reef fish distribution and abundance within near-shore reef habitats of Yap State, F.S.M.